As time passes, most people fade into obscurity. Their names are forgotten, unless something is named after them or someone passes by their headstone. Their existence is forgotten until an ancestor digs them up (not literally, I hope), or a researcher starts poking around in the history of a place or object. Some people though stand out through the mists of the past, their names are passed on and their stories repeated. One of them would be Maria Lord. Which is why she doesn’t have an entry in here before now. As it says on the side “The focus is on ordinary working women whose stories HAVEN’T been remembered, and retold, and rewritten” but it also says “I don’t ignore someone just because she happens to be well known”, and I happened across Maria’s headstone at New Norfolk last year (so I have a picture of something other than a newspaper article). The headstone is a little hard to miss. It’s the only one that hasn’t been cleared away and put on the side. What I am not going to do here is recount her story. That has been told, many times. 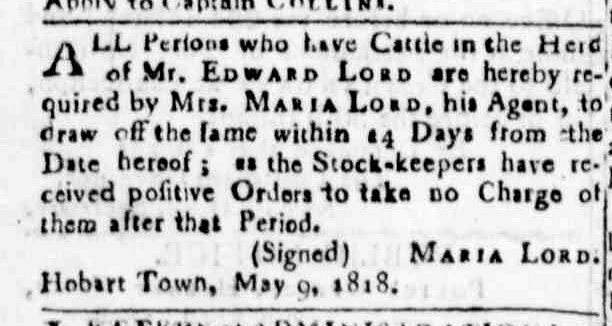 Of the online versions, Maria Lord nee Risely: convict, entrepreneur, wife, mother is definitely the most readable and detailed (if a little inaccurate once it veers away from Maria’s life). 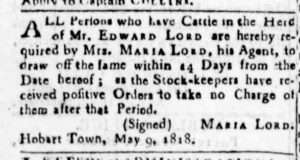 While [husband] Edward concentrated on acquiring land and capital, Maria expanded her retail interests, forming partnerships with her brother John Risley, who arrived in the colony in 1819. 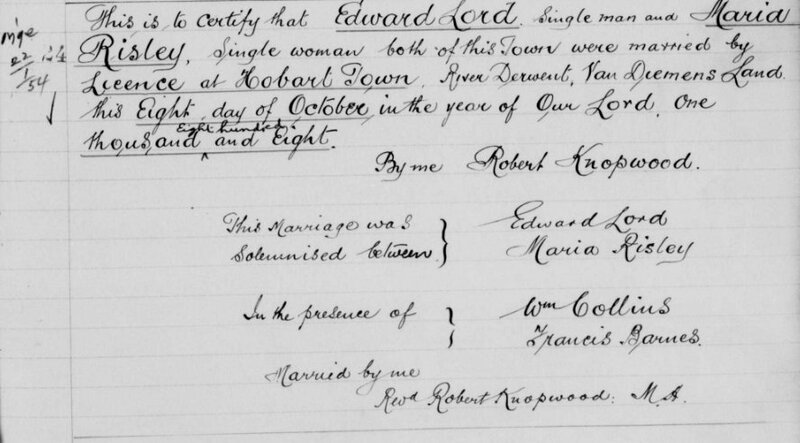 From 1816 Edward travelled regularly to England, often with one or more of his children, who were left there with relations or in schools. 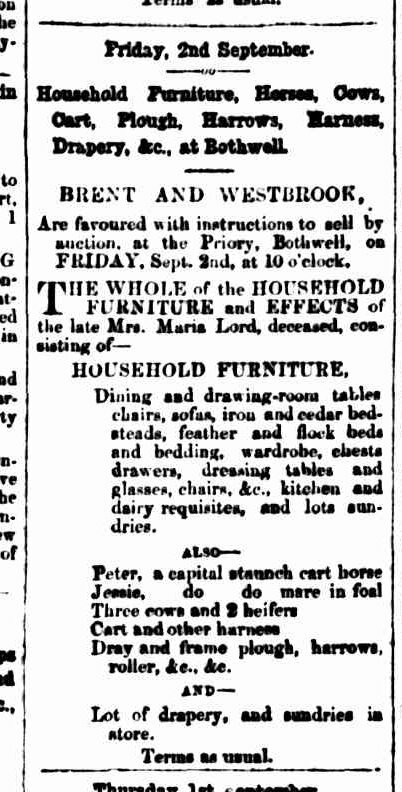 During his absence, Maria acted as his agent and ran and extended his business, various well-stocked properties and two hotels. By 1820 she reputedly controlled over a third of colonial resources, holding monopolies for the supply of wheat and meat and a portion of the profitable rum trade. Socially, she was recognized as the wife of one of the colony’s richest men. 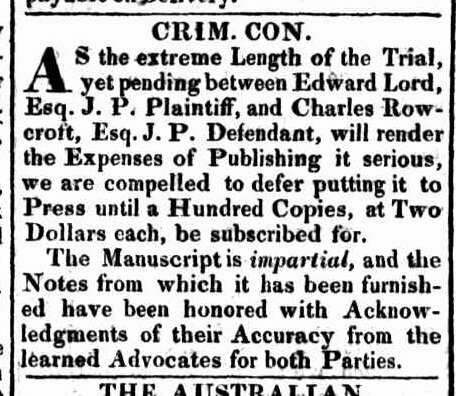 In October  Edward returned to Hobart Town, where he successfully charged Charles Rowcroft, who had been frequently in the company of Maria, with criminal conversation. Immediately after the trial, Lord went back to England, taking his youngest daughter with him. Rowcroft also left the colony. 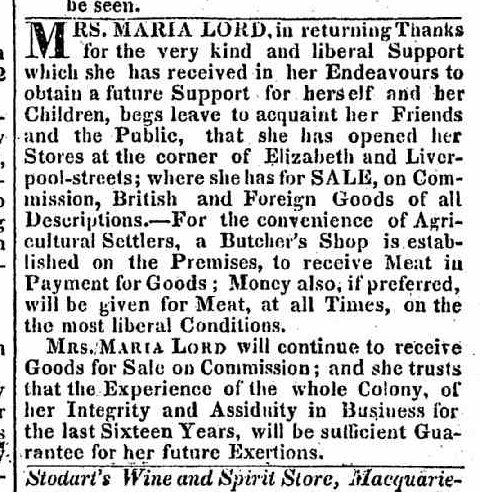 Back in Hobart Town, in 1825 Maria opened a retail shop and a butchery. 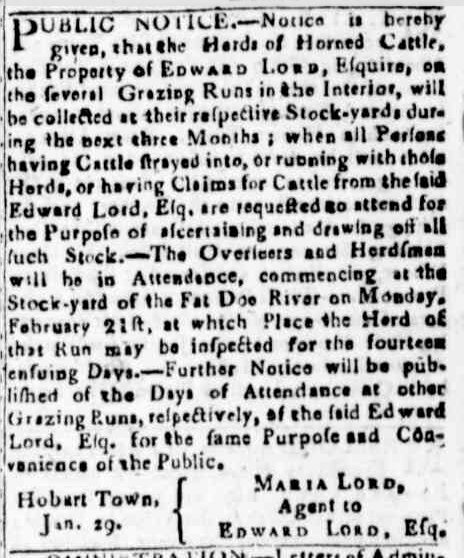 Edward reappeared briefly in 1828; his convict servant Ann Fry named him as the father of her child. 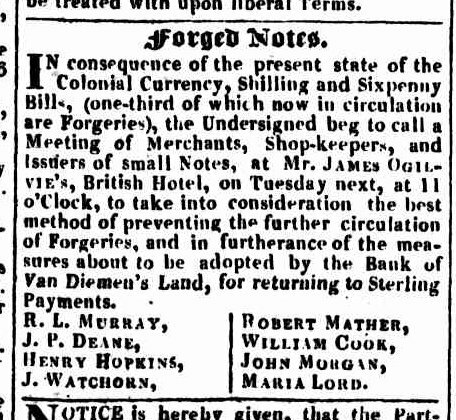 He had also established another family, with five children, in England. 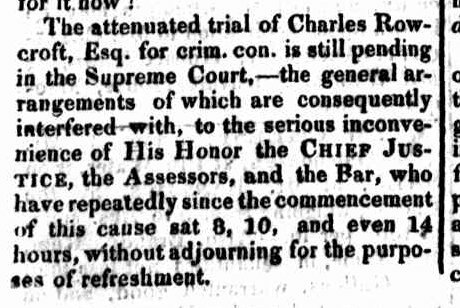 The trial is interesting, not so much because of what happened but because there’s no apparent record of what happened. 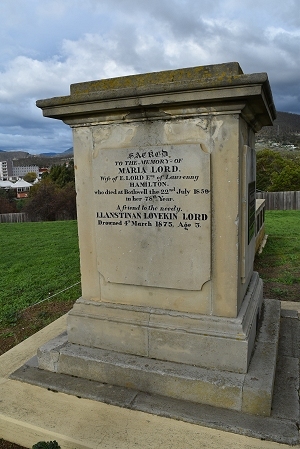 The usual source for such information for that time is the newspaper, the Hobart Town Gazette, but no account appears. Not so much because it couldn’t be ublished, but I think the proprietor saw a chance to make a quick buck, that doesn’t seem to have panned out. Monday 6: The Supreme Court opend on the business of C. Rowcroft Esqr. 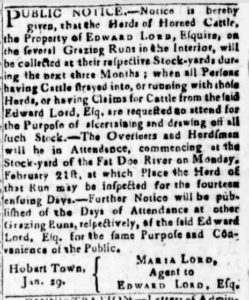 and Mrs. Lord, wife of E. Lord Esqr. 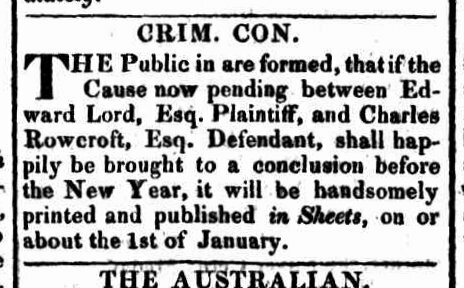 on a Crim. Conn. information. I could not attend the office, being summond at the Supreme Court. As the ADB entry says, after the trial Edward went off to seek solace elsewhere and Maria went on being a successful and respected business woman. 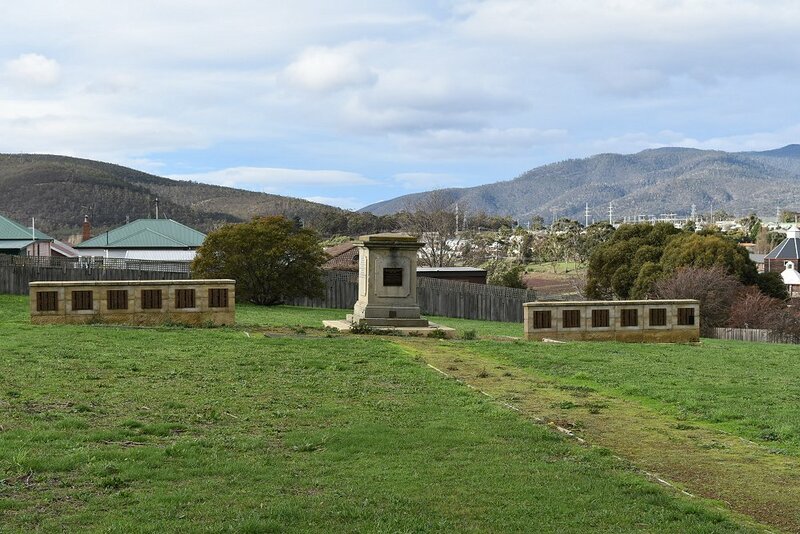 Police, Hobart town.-On Sunday afternoon the 21st December, Mrs. Edward Lord having sent the other servants to church, called to the man servant “William, take this dish away,” but receiving no answer and hearing a noise in the kitchen, she entered and saw a stranger hurrying out at the doorway. She quickly followed, and taking him by the collar, asked “what do you here?” “Nothing,” said the man, who proved to be a Dutch pedlar. Mrs, Lord then charged him with robbing her, and the man pulled a large shawl from his bosom, and ran away. Mrs. Lord however, followed and again held him, he then pulled out a silk handkerchief and other articles of dress, and again attempted to make his escape, but was resolutely held by Mrs. Lord until a gentlemen passing, she called him to come so her assistance, and the thief was ultimately secured. During the interval he begged earnestly for pardon but Mrs. Lord said, if he had come and asked for a loaf of bread she would have given it him, but to break open a box of apparel in the kitchen, and rob her poor servants, was not to be forgiven. 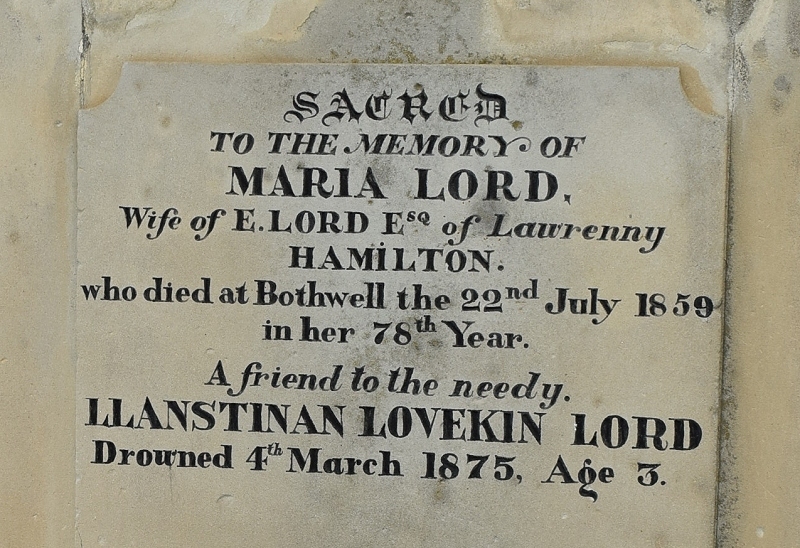 Maria moved to Bothwell, where she died in 1859. I don’t think it’s wrong to say history has looked much more kindly on her than it has on Edward.